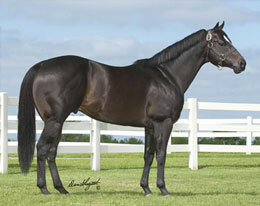 Ivory James' Home Boy James finished third in the $72,000 Mr Jet Moore Stakes(RG2) on Thursday night at Remington Park. OKLAHOMA CITY, OK—APRIL 8, 2019—Home Boy James, a son of multiple stakes sire IVORY JAMES, finished second in the $72,000 Mr Jet Moore Stakes(RG2) on Thursday night at Remington Park. Racing for owner Jose Martinez, Home Boy James is conditioned by Erik Rodriguez-Garcia and was ridden by Cody Wainscott. The $17,000 runner-up payday increased the 7-year-olds earnings total to $112,222. Maynard Greeson bred the brown horse in Oklahoma from the Dashin Chico mare Sacchi Mmg. He has compiled a (33) 9-6-3 record.